Saca’s proudly catered the Chamber’s Women’s Luncheon at Casa Colina! https://www.gotosacas.com/wp-content/uploads/2019/02/Sacas-Logo_01_Color_RGB-300x61.png 0 0 Bruno https://www.gotosacas.com/wp-content/uploads/2019/02/Sacas-Logo_01_Color_RGB-300x61.png Bruno2019-01-25 19:02:132019-02-27 19:11:53Saca's caters the Claremont Chamber Women's Luncheon at Casa Colina. 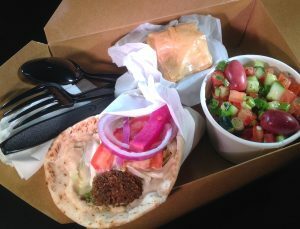 Saca’s Lunch Boxes provides a full meal in a box, with a Pita Sandwich, a Fresh Salad and a Baklava. Just choose you sandwich and your salad, make it vegan, vegetarian or dairy-free if you want, we will pack it with utensils and napkins and label it. Convenient and easy to transport, Saca’s Lunch Boxes are ideal for small or large event on the go. To learn more, click here.